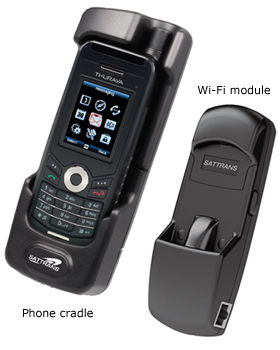 SATTRANS Wi-Fi CommStation is an accessory to Thuraya satellite phones that allows to use smartphones, tablets, and laptops for satellite voice calls, text messaging, emergency alerts and data services. The CommStation is designed for use in various types of mobile and fixed installations, including vehicles, trains, vessels, offices, shelters, base camps. The Wi-Fi CommStation offers functions similar to SatSleeve without the need to purchase another satellite terminal or pay for several subscriber accounts. Just use your existing Thuraya phone and subscription. Most of your existing Thuraya equipment (phone, antennae, cable, accessories, etc.) can be used with Wi-Fi CommStation. Note for users in Australia: Thuraya docking stations are usually supplied with a South antenna. Neither North nor South antennas will work in Australia. For use in Australia, one must purchase our universal Thuraya Hemi Omni antenna, which is designed to work throughout Thuraya coverage.